A quick fence fix today can save you from costly repairs down the road! No matter what kind of fence you have, you need to make sure you take care of it. Putting off repairs can put your fence at risk of weathering, insect infestation, or total collapse. So what should you do? Follow these tips and fix up your fence this summer. One small problem can soon become a huge headache. Don’t let that happen to you – whenever you spot something wrong with your wood fence, take care of it right away. Vines and flowers look beautiful when you use them as decorative touches, but don’t let them grow out of control. You should also deal with any insects like termites or carpenter bees who have turned your wood fence into their next nest. If you’ve recently painted your wood fence, make sure that you don’t need to apply a new coat of paint just yet. Either way, a few layers of wood stain wouldn’t hurt. You may have heard that vinyl fences are easier to take care of than wood fences are. Well, that part is true, but it doesn’t mean you can completely neglect your vinyl fence all summer long. 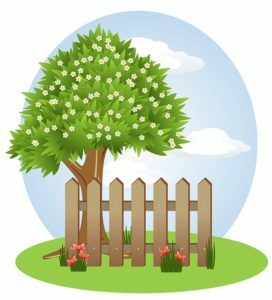 Look at the plants, such as the bushes and trees, that grow around your vinyl fence. You might have to trim the hedges back or prune the tree if the branches are getting too long. Are you concerned about covering your aluminum fence in topsoil, earthworms, and fertilizers from your livestock? In that case, take a closer look at your fence. All you need to clean an aluminum fence is a garden hose and a powerful spray of water. But be on the lookout for any odd stains or stubborn patches of rust that just won’t go away. This entry was posted on Friday, July 13th, 2018 at 12:39 pm. Both comments and pings are currently closed.